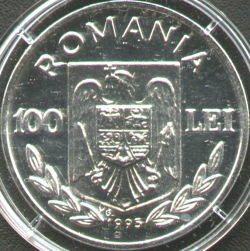 Obverse: ROMANIA, denomination "100 LEI", Romanian coat of arms and year 1995 betweem two laurel branches. At the lower-left coat of arms lies V.G. standing for Vasile Gabor, the engraver's name. 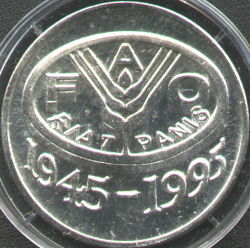 As a warning, taking the coin, even for a short while, out from the plastic capsule inside which it was sold, will result sooner or later (months or years) into a loss of shininess, the coin turning yellowish on areas.